stylos: Book Note: Thomas Watson's "Heaven Taken By Storm"
Book Note: Thomas Watson's "Heaven Taken By Storm"
Thomas Watson, Heaven Taken By Storm (first published 1669; Northampton Press edition, 2007): 143 pp. 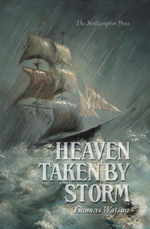 I just finished reading this attractively formatted reprint of Watson’s Heaven Taken By Storm which bears the alternate title of “The Holy Violence a Christian Is to Put Forth in the Pursuit After Glory.” The premise of the book is an extended meditation on Matthew 11:12: “The kingdom of heaven suffereth violence, and the violent take it by force.” Watson takes the passage to mean that believers are to be “violent” (passionate, dedicated, active, aggressive) in living out the Christian life. This “holy violence” will include “violence to ourselves” though the mortification of sin. It will also include the “violent” pursuit of the ordinary means of grace. Indeed, the heart of the book is Watson’s urging the basic spiritual disciplines of reading and hearing the Word, prayer and meditation, self-examination, sanctifying the Lord’s Day and holy conversation. Watson observes, “Some think free grace will save them; but it must be in the use of means” (p. 61). “There is a sea of sin in us” (p. 28). “There cannot be so much sweetness in sin as there is sting” (p. 31). “Many truths are lost because ministers pour their wine into sieves, either into leaking memories or feathery minds” (p. 34). “The eye can see everything but itself. It is easy to spy the faults of others, but hard to find out our own” (p. 37). “In suiting his temptations to the complexion and temperament of the body, Satan studies facial features and expressions and lays suitable baits” (p. 50). “Industry in one’s calling (when excessive) is covetousness” (p. 51). “The world never kisses us except with an intent to betray us” (p. 53). “A true saint is crucified to the affections of the world (Galatians 6:14). He is dead to the honors and pleasures of it. What delight does a dead man take in pictures or music?” (p. 54). “Our salvation cost Christ blood; it will cost us sweat” (p. 61). For those who put off piety to old age: “No man says, ‘I will learn my trade when I am old’” (p. 77). “Do we pray in the morning as if we were to die at night?” (p. 80). “Would it be a good plea for a servant to say to his master that he was so drunk that he could not work? Truly, ‘tis much like you saying that you were so drunk with the cares of the world that you could not be violent for the kingdom” (p. 90). “This holy violence will not hinder men in their secular employments. Violence for the kingdom and diligence in a calling are not inconsistent. Christians, you may work for heaven, yet work in a trade” (pp. 103-104). What some will say on their deathbeds: “Oh, that I had a Bible in my hand when I had a deck of cards!” (p. 112). On the mystery of election: “Do not therefore perplex your thoughts about election; this book is sealed, and no angel can unclasp it. The rule Christians are to go by is God’s revealed will, not His secret will” (p. 115). “Use the world as your servant, but do not follow it as your master” (p. 117). “Be serious, but cheerful” (p. 118). “The flesh is a bad counselor” (p. 120). When friends attempt to dissuade you from this violence, remember: “‘Tis better to go to heaven with their hatred than to hell with their love” (p. 121). “If you would be violent for heaven, get under lively preaching… The Word is a fire to thaw a frozen heart…. It is as good almost to be without preaching as to be under such preaching as will not warm us” (p. 123). “The heart is a virgin God himself is suitor to” (p. 137).